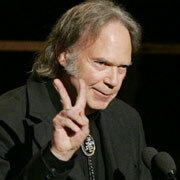 (Burbank, CA) June 29, 2006-Two exciting new additions to Neil Young's website make their debut today. Living With War Network will feature both brand new videos and documentaries for songs from the recent album Living With War, as well as rare archival material from the musician's past, including a live clip of "Mideast Vacation," filmed in 1987. Several other surprises are going to be available on the site soon, making it a not-to-miss interactive destination for everyone interested in world events. Living With War Today, with its motto "All War All The Time," is a special online newspaper with an wide array of features, ranging from a unique Time Line Analyzer to reports from the Crosby, Stills, Nash & Young Freedom of Speech '06 tour. There will be continual tour info and updates, which starts Thursday, July 6th in Camden, NJ, continuing across the United States and Canada. A unique feature of the newspaper will be a section for artists to submit their own protest or topical songs and videos for possible play on the LWW web network. Along with that is the LWW Today Questionnaire, which asks readers to share their thoughts on five questions regarding the war, with selected responses to be posted as they come in. Other newspaper items include the exclusive Time Line Analyzer, which allows website visitors the ability to track events before, during and after the Living With War album throughout the media. The Great Debate section, which collects all the pro and con reviews of Young's Living With War album is also now available at LWW Today, allowing readers to fully trace all the critical reactions to the controversial release. Other highlights include an exclusive travel section, as well as a series of features on each song from the album. The first story, "After The Garden," is written by noted scribe Jack Flak. Others will become available over the summer. Two important icons are included near the masthead that provide links to both the USO, so readers can support those in the military needing assistance, as well as the League of Women Voters, for those seeking voting information regarding the upcoming election in the Fall.